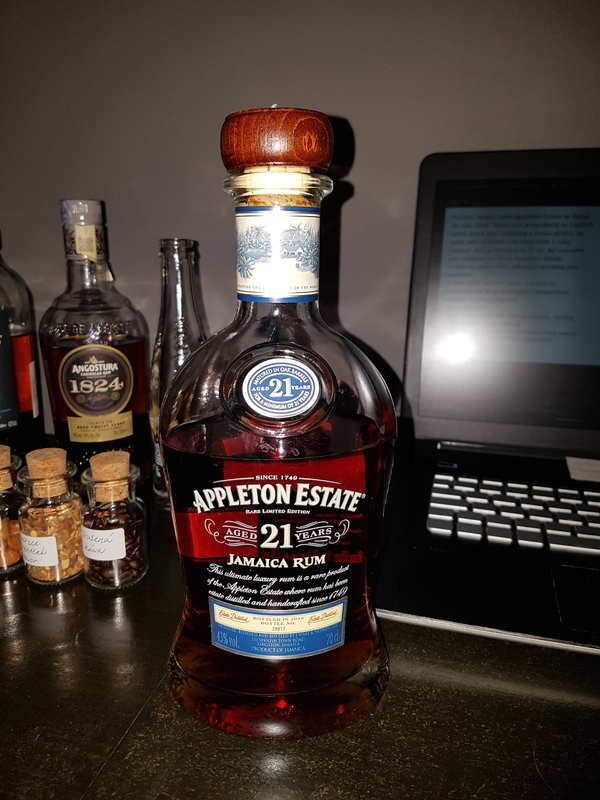 Have you found an online vendor selling Appleton Estate 21-Year? Distilled using small-batch copper pot stills uniquely designed for Appleton Estate, this rum is a blend of several rums aged 21 years in American oak barrels. Once blended, the rum is re-casked for two years to marry the flavors. Appleton Estate 21-year rum is produced in Jamaica on one of the country’s oldest and most renowned sugar estates. Each bottle is individually numbered and comes with a signed aging certificate by master blender Joy Spence. And if you share this with friends and family, it is virtually guaranteed you will be shelling out another $120 for a replacement bottle. And your friends will want to know when you bought it so they can come back to "help" you enjoy it. What a bunch of great friends, eh? I admit that I am drawn more to the sweeter rums but there is something about this particular rum that just makes my taste buds smile and do a little jig. Makes my tongue feel weird but jig buds, jig. They dig it! Now I could go and try to figure out what all those nuance flavors are but my palate just ain't that edjimacated so I won't even try. I know there are a plethora of flavors that master blender Joy Spence has captured so I will just enjoy them as balanced as they are. One minor suggestion for the fine folks at Appleton Estates...the bottle is beautiful and the wood stopper and natural cork are a must but it would be so cool if the logo on the top of the stopper would have been laser etched rather than inked on. This about it? First of, the presentation of this rum (the new bottle) is great, and I must say that I really appreciate a no nonsens brand like Appleton, that treat their rums with respect and no added sugar. This 21 yr. has a nice brown darkish colour and a wonderfull nose that greets you with saplike brown sugar, oak, green apples, sweet tobaco and dark chocolate. The palate is full, smoothe and well rounded with lovely balanced notes of pepper, oak and very dark, rich chocolate. The finish is a mouth watering, slightly dry, but discretely sweet sensation, that lingers pleasantly for a long time. I enjoy it very much. Even though the competion is stiff at this pricepoint, this one keeps growing on me. Beautiful aroma, warm and smooth taste. Many layers and long aftertaste. Not sweet not dry - perfectly ballanced. This is rum for special evenings. (This is for the"old" bottle, with blue metallic cap like on the picture. Not sure the new bottles contain the same liquid...) As I liked the 12 year I tried a sample of the 21 years. Nose : typical Jamaican rhum. Taste : as expected it is oaky... Too much in my opinion, it tends to dominate the other aromas. I did not found it as balanced as the 12y. A good aged rhum but for one third of the price I still prefer the 12y. I am a bit suspicious about this rum : very verrrry smooth, almost artificial and absolutely odd for a 21y spirit .Sugar tests seem to be OK, what the hell they have added in it ?! There are so much true gems and genuine rums, less ""premiumized"" for the same price. (Je parle de l'ancienne bouteille avec le bouchon métallique bleu. Je ne crois pas qu'il y ait exactement le même liquide dans les nouvelles bouteilles) Nez : typique de la Jamaïque. Par contre en bouche j'ai du mal à sentir autre chose que le côté boisé.... c'est un peu normal après 21 ans mais je trouve que ça écrase un peu tout le reste. Pour moi il n'est pas aussi équilibré que le 12 ans et pour un tiers du prix je crois que je préfère le 12 ans. D'autre part ce rhum est d'une rondeur exagérée et inimaginable pour un rhum de 21 ans... ce côté quasi artificiel me dérange. Apparemment il n'a pas été sucré, mais alors qu'est-ce qu'ils ont ajouté là-dedans ?! Pour le même prix on trouve de vraies perles, souvent plus authentiques et moins "premiumisées"
I want to like this rum because it’s hard to find and expensive but it finishes with that same plastic taste of mass produced liquor. The oak flavor and mellow heat are good but I can’t get around the aftertaste. I couldn’t recommend spending the money on it, but if someone offers you a sample try it for yourself. Well this is an excellent rum. No sweetie it is not sweet so Men Only Please. Great up front flavor. Dried fruits, light hint of Carmel and leather. Very smooth and goes down real nice. Excellent finish. It's worth every penny! You'll hear whiskey drinkers boasting about the $200 they spent on a bottle of Johnnie Walker Blue. Well, if you're a rum drinker...this is your Johnnie Blue! If you have the means, this is a must try. What does it taste like? It tastes like the Caribbean. The only bad news is that 8 year old rums will taste generic for a while and even some Anjeos will lose their appeal after drinking this rum. If you gave this rum a rating of 8 or lower you either have horrible taste buds or a sinus infection! This rum is about one of ten in the world that set the bar. 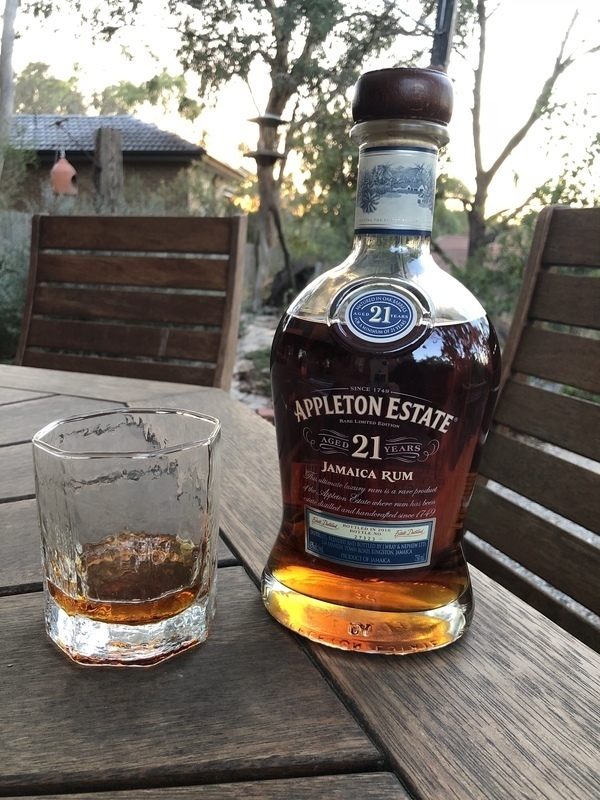 The Appleton 21 is quite simply the best rum I've had. I prefer it over whichever Zacapa or other premium rum. It is exceptionally smooth and the taste is fantastic. I had a 2 ounce pour of this rum at Bahama Breeze - if you ever go, their price of $11 is just above cost (this is in NC). Honestly I found the wood in this to be a little strong, and I actually prefer the 12 yr which is better balanced. But this is definitely one you want to try if you have the opportunity. The empty glass smelled so wonderful that I wouldn't let our waitress take it away until we were done with dinner. Just the right balance. All the flavours with just the right amount of burn and a wonderful long finish! This bottle was a vacation splurge for me. This will probably be the best rum I own until I slowly finish it off. My dad would say there isn't enough Os in the word smoooooooooth. The color is picture perfect. The balance between sweet caramel and smoke is exactly why I got into fine rums to begin with. This bottle will remain the center of my display shelf and only touched on special occasions. I love it and I don't want it to go away. it isnt until you go one more step up the ladder to the 30 year old that you're like "ok. dayum. thats rum i want witout a mixer." it is still very good, and goes well with it's fruit laden notes, but if you're going to spend up, spend up and go one more down the rabbit hole. Beautiful color, nose is oaky, caramel, citrus. Taste is aged oak, nutty, with a dry finish. Oak taste lingers. This is my first Appleton. Look forward to drinking more of this rum. This is my favorite rum and I compare all rums I taste to it. I was raised drinking bourbon but Rum has become my drink of choice. Let's face it, all distilled spirits start as ethanol with the difference being the parent source of it's sugar ( or starch) i.e: corn, wheat, rye, potatoes, molasses, fruit or whatever. The ethanol distilled from these sources will carry some it's parent's distinct flavoring. Other distinctions can be the number of re-distillations, water used to cut or water it down, percent of alcohol in the finished product, if aged, the type of aging. additives introduced that enhance flavor or color and many more processes. With rum, since it's parent is molasses it should naturally have a hint of sweet molasses flavoring and when aged in new white oak barrels or used white oak whiskey barrels it should pick up the flavors left by the whiskey and the charred oak. (Some rums are double casted in oak and then used wine barrels) The aging process should add flavors, color and smoothness, cutting down the harshness we find in fresh distilled alcohol. 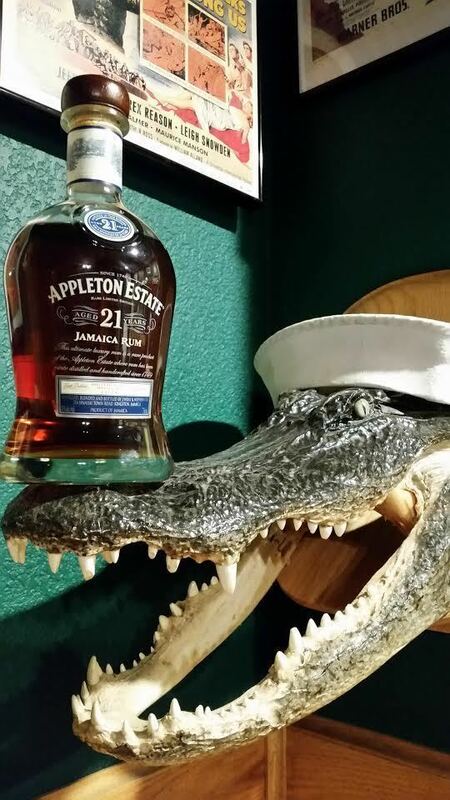 The Appleton 21 year old is robust, filled with flavor of molasses, and vanilla from the oak, not to sweet and very smooth for a rum but it still has a little bite. It is a rum that when I sip it I get a warm felling throughout my body. Others have commented that the Appleton 12 year old is very similar to taste while quite a bit less expensive. I would agree but find the 21 yr. old more robust enough to pay the difference. Because of the price difference, I do sip the 12 yr. old more often. I give the 21 yr old a 10 as I considerate it the gold standard of rum. All adulterated rum producers take note. This is how it's done. Love the new packaging with the added detail of bottling number & a small detail of certificate highlighting that it's a true minimum 21 yr old blend. Lovely coppery orange colour. Instant familiar Jamaican funk aroma although more balanced than the younger version. Tasting smooth, sweet with oily spicy texture and some oak which not overpowering at all. Very long finish. Love it. Well worth it. Quite simply the best rum to have graced my tastebuds. Very smooth, and leaves a sweet taste in your mouth as it leaves. Packaged well in a nice bottle that displays its gorgeous colours perfectly. Warm with a powerful burn and a dry initial flavour. Once the burn fades it is sweet, crisp. Soft nose. A fine rum for sipping. Very much a rum you could compare to a fine scotch of the same value. A good one to offer your whiskey/scotch loving friends that don't take rums seriously! Lots to enjoy here - oak and toffee primarly - plus some mild scent of vanilla. Very smooth and dry. Not sure it's worth the price, however. Better-tasting rums abound at half the cost. Nicely packaged. Comes in a nice solid container & the new bottle looks more like the Exclusive Jamaica bottle. A strong wood flavour there but not over powering the rum & not to spicy. Very smooth & very addictive! Goes down a little to easy & the glass smells devine afterwards. Even the next day when you clean up you can still get an aroma from the glass so it has good staying power. The only problem I have with this rum is, at $210 per bottle it's a once off for me. There are to many other great rums just as good out there at half the price or less to justify buying again. This rum smells great, though it is a bit dry and strong. It's better than the low end Appletons as it has a light sweetness and it's smoother, but I actually prefer the Appleton 12 and especially the 12 Rare Blend which are just a tad sweeter, whereas this is a bit more oaky. Smell and taste includes vanilla, almond, cocoa, molasses, nutmeg, and oak. I bought a 2nd bottle after I emptied the first, and I still prefer the 12 ever so sligthly. Had a big rum tasting a few months ago and this was in the top 2 favourites. In fact the whole Appleton range was very well favoured. We destroyed a bottle of V/X in a sitting with a few mates. Lovely with a coke mix. Wish I got more bottles. But this 21 was just something else. If you are into the really sweet rums, than this probably isn't for you. Go towards Diplomatico if that is your taste. This finishes a little dryer, but that doesn't take anything away from it. It is a damn fine rum. Lovely oak and vanilla. Very smooth and minimal burn. Drink it straight up, sit it and just enjoy. Firmly in my top 5.